In 1712 an accomplished Moravian scribe in Vienna, Aryeh ben Judah Leib of Trebitsch, started what would soon become a second flowering of Hebrew manuscript decoration in Central and Northern Europe. 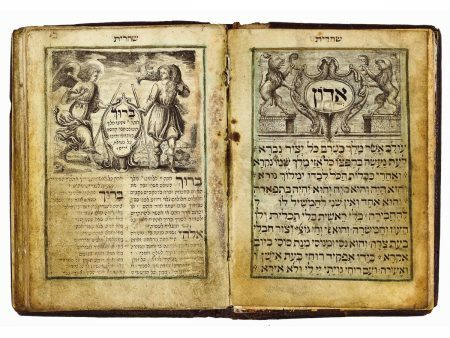 Between 1712 and 1714 he copied a daily prayer book that is now in The Library of The Jewish Theological Seminary in New York (MS 9340). At the bottom of a dedication page he signed his name: “The young Aryeh Judah Leib Sofer, son of the late Elhanan Katz, of blessed memory, who passed away on Friday, 28 Iyyar in the year 5468  in Jerusalem.” Today some dozen manuscripts of his are known, among which at least five are daily prayer books. Aryeh ben Judah Leib is the first recorded scribe to have written his manuscripts “with Amsterdam letters.” Title pages of books printed outside of Amsterdam in the late seventeenth and early eighteenth centuries often contained a statement that the books were printed with Amsterdam letters, as an indication of quality. Aryeh ben Judah Leib trans- posed this custom to manuscripts. As a number of his manuscripts contain images that were printed on parchment, he may have been involved in the printing industry, although there was no Hebrew printing in Vienna at the time.